Okay, I only have time for a quickie. Things have been hectic. But I am in the mood to tell a story. 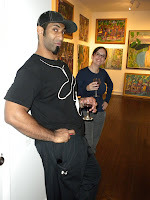 Traci and JR are some Old City Dwellers that make running an art gallery all worth the effort. Now friends as well as collectors, these guys bring awesome energy where ever they go. I am blessed to know them as friends. As collectors, they are shrewd! I can say that, right? That’s all I’m saying. My short stay here in Old City, Philadelphia has been awesome, in part because of the remarkable people I get to meet. Everyone does not want relationship; I’ll give you all the room you want. I’ll willingly engage with those desiring discourse. Ask me about the art, I’ll share. JR came through a few months back. We hit it off well. Things went well until we got into a fight, a verbal argument over art. We didn’t talk for two months. Acknowledging the foolishness of our tiff, we made up one day when JR was trying to hide behind a menu at a prominent neighborhood outdoor restaurant. Neither of us remembers the nature of the disagreement. Traci will tell you the problem stems from JR and I liking the same art. The bottom line, we enjoy getting together talking, selling and buying art. I doubt we’ll fight anymore. From what I understand, JR has a remarkable collection of art, including a Warhol and a Dali. I don’t know a lot about JR, none of that stuff matters. In my mind, he is some eccentric millionaire that wanders the streets, doing whatever he wants whenever he wants. One never knows what to expect from JR. However, if you are in a jam in need of assistance, you can count on him to help. 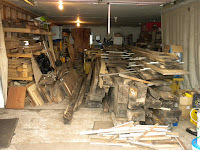 He has even helped me move 4 large truckloads of precious milled ha rdwoods into my shop, up in Bucks County. He’s only let me down once. I called him to have him bring me a cup of coffee to the gallery. He texted me an hour later saying he was in New York visiting a painting he had donated to an art show. Beware of return favors. The best part of being JR’s friend is that we never know what will be asked of us in return. JR has a unique sense for fun. An avid videographer, JR develops and films eccentric themes that are part of a project, the direction of which, save for Traci, is known by him alone. On one occasion I was asked to participate, as an actor in one of his films. As all things are a mystery with JR, I am not at liberty to share the nature of my role in the video. You are going to have to wait for the release of his film. Okay, in talking about JR and his love for film, I’ll share my favorite line from the Basquiat movie filmed by Julian Schnabel. Here’s the set up - over a plate of spaghetti, Jean Michel Basquiat is complaining about the press and how they have hit pit him against Warhol. The Julian Sch nabel character, played by Gary Oldman, in response to this rant about the press, says something like …”Jean Michel, go and see Andy; you are all he cares about. And besides, it’s hard to get good conversation in this town.” It is like that with JR; not your garden variety of conversation. Time spent with JR is never boring. On the ground level he’s the consummate artist and life is his art. 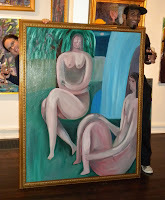 The pictures show Traci and JR celebrating their latest acquisition, “Night Bathers 2, a waterfall painting, by Christopher Callahan. These young Old City Collectors know a good thing when they see it. They also bought “Making Friends” a few weeks later. 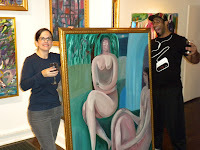 The Duo, as I call them, shares my vision of supporting Philadelphia painters. They also purchased a few Ashley Flynn Paintings, back when Flynn showed in the summer. JR will play cat and mouse with you, but in the end, he knows what he likes and wants. JR’s got his own thing going on. Don’t see a lot of that going around; proper respect given to that. He’s about believing in what you do as the sole motivator for everything else –with no excuses. As a personal trainer, I have only known JR through a limited lens. He berated me for taking a left turn off a monster hill, on my bicycle, to shift to a lower gear. From then on there have been no left turns. No excuses. He’s demanding in his perspective and position on things, but at the same time demonstrates he knows the road ahead that will set you free. Okay, I said this was going to be a quickie. I Gotta rap this up. It’s been real. Guess what gang? My friends and customers are real special. No, this is not your traditional gallery. Yet, what you see is what you get; great art, great friends and fresh perspective. Traci calls me Uncle Karl. Man, life is good. Thanks guys. I love what you bring to the Gallery.